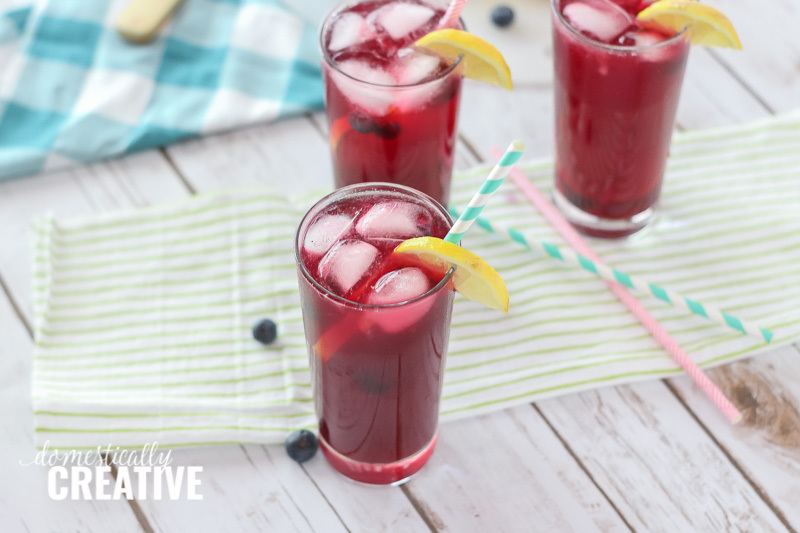 Cool down this Summer with a refreshing and fizzy blueberry lemonade recipe that is both easy to make and sugar-free! 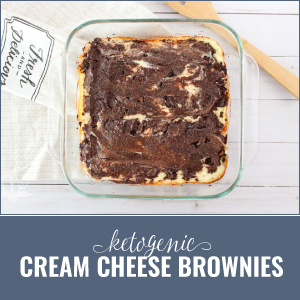 Only a few simple ingredients needed! My favorite Summer time drinks are any type of flavored lemonade. 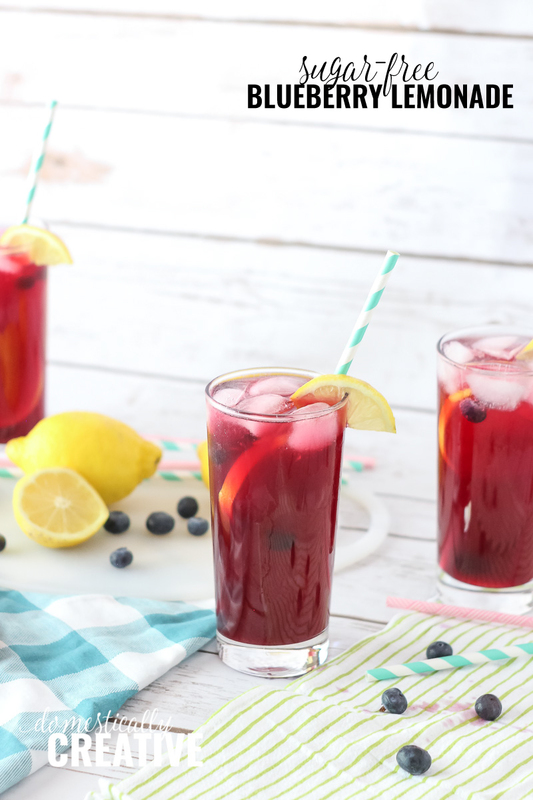 Lemonade is such a staple drink of Summer probably because it’s such a light and refreshing drink. I prefer my lemonade on the more tart side, while other like it a little more sweet. Not surprisingly, most store bought and even homemade lemonade has a ton of added sugar in it to give it the sweeter flavor. So to make this blueberry lemonade recipe sugar free and therefore lower in carbs, I had to get a little bit creative! 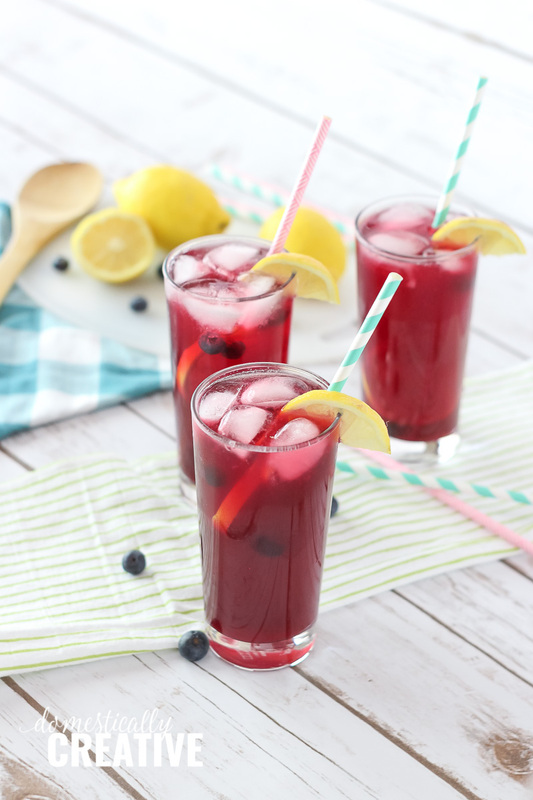 Most flavored lemonade recipes start with a simple syrup that is made with the fruit of choice, sugar and water. To make a “sugar-free” blueberry simple syrup, I experimented with replacing the sugar with Swerve granular sweetener instead. It worked! While a sugar-free simple syrup using Swerve does not thicken as much as a traditional simple syrup, it does break down and thickens slightly. Please note that I haven’t tried making a simple syrup from any other Erythritol or Stevia based sweeteners, so they may yield different results. That really is the base of this recipe! To make the lemonade, you just need to juice several lemons (about 7-8), add water and then sweeten to taste. You could use any sweetener you choose, but I do like using liquid Stevia because it disperses and dissolves well. A lot of Erythritol based sweeteners don’t dissolve as nicely in cold liquid. 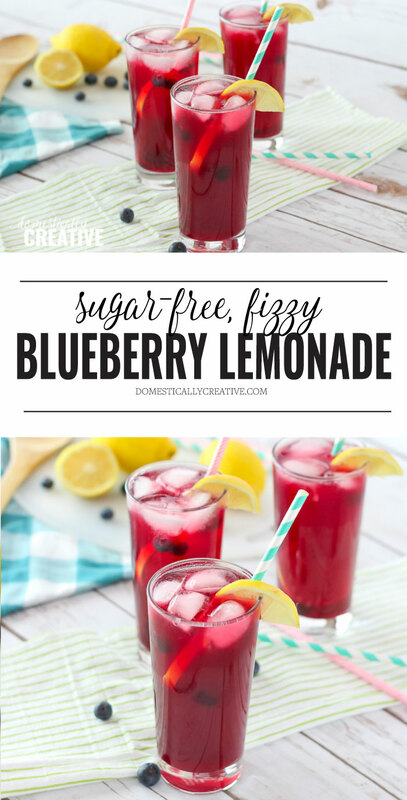 Just add the blueberry simple syrup to the lemonade and you are set!! To make it an even more refreshing Summer drink, top your glass off with some sparkling water. 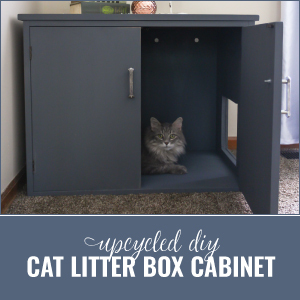 And if you want to get real fancy, add some Lemon or Berry LaCroix to take it over the top! In a medium saucepan, add blueberries, 1 1/2 cups water and 1/2 cups Swerve granulated sweetener. Bring to a boil, reduce heat and let simmer until blueberries have expanded and start to break down, about 10 minutes. Pour over a fine mesh strainer into a glass container to separate out berries and seeds. Toss berries and place blueberry mixture in fridge to cool. 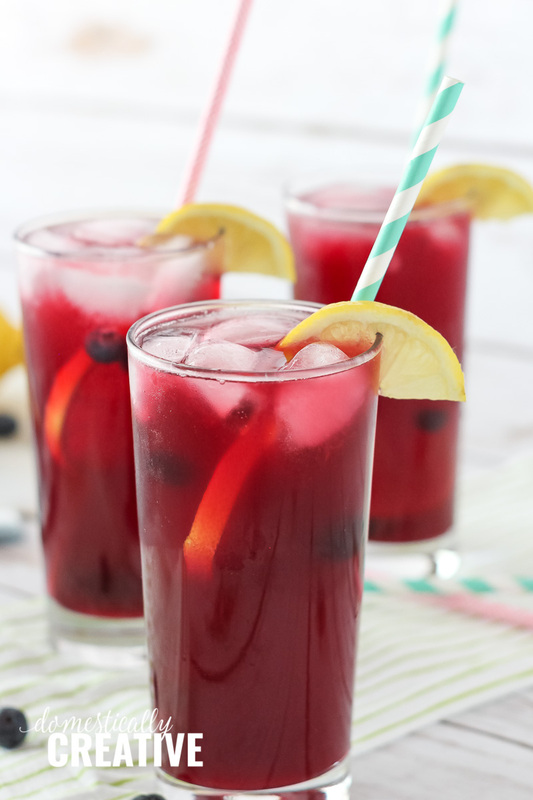 While berry mixture is cooling, juice 7-8 lemons (or use regular unsweetened lemon juice) and place in a pitcher. Stir in 5 cups water and 10-12 drops liquid Stevia (probably 2-3 packet equivalent) to taste. Serve over ice and only fill 3/4 of glass. Top with sparkling water for fizz! 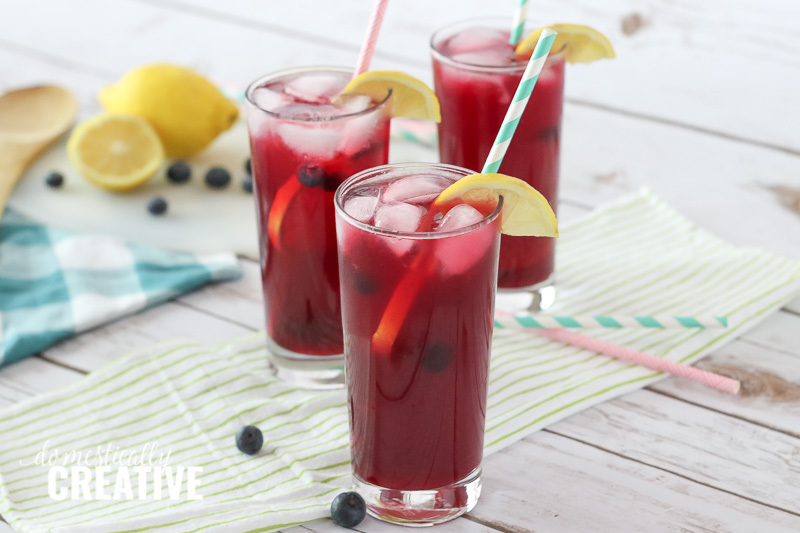 Garnish with extra lemons and blueberries. I like that it is fizzy! I love fizzy summer drinks. This has a beautiful color! If I wanted to add sugar instead of the non-sugar sweetener, do you have any idea of the ratios? (We keep our lemonade VERY sour btw…my husband hates “That sweet stuff!”). I would start with maybe 3/4 of a cup to get a nice syrup. 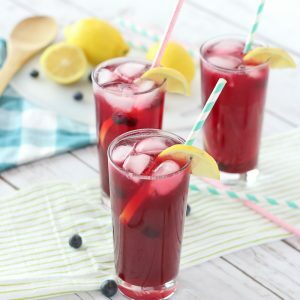 If he likes lemonade a little more sour then try only adding 1/2 of the simple syrup as you can always add more for added sweetness! Yummy! And I love the fact that this recipe is sugar free.